Aashish Sangoi, Papa of little Ananya in the San Francisco Bay area, shares some moments from his first few weeks of fatherhood. 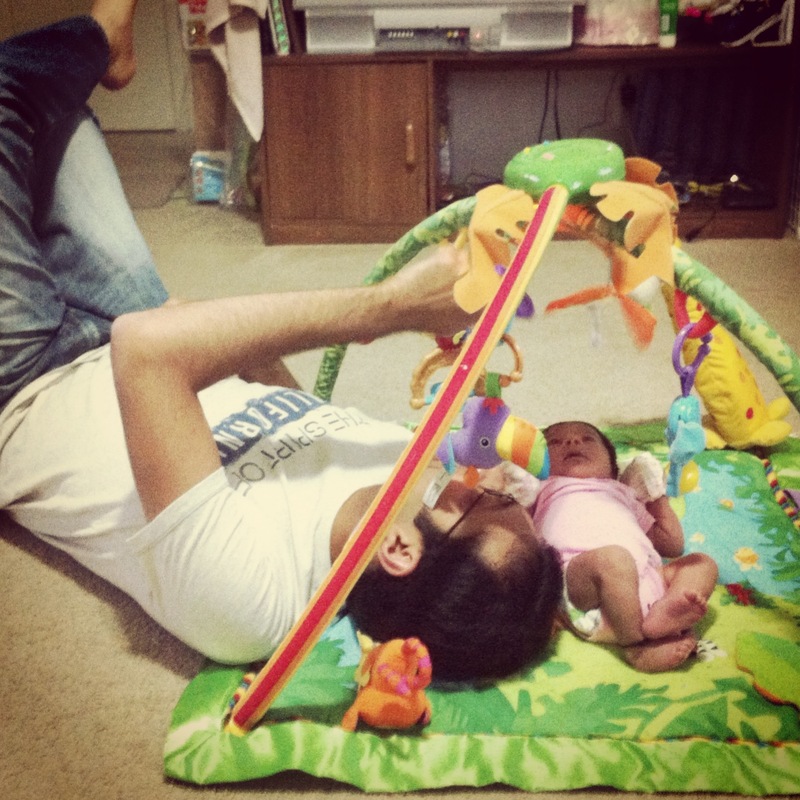 Our baby – Ananya – is seven weeks old. At this stage, she is pretty much asleep most of the time and only plays for an hour or so every day – although that time is increasing every week. Since she is not mobile and her eyesight can only focus up to a foot away – her playing ‘activities’ are limited. She mostly plays on her own when the conditions are right – full stomach, empty bowels. Her hands box and her legs kick when she is in a playful mood. We use a couple of props to play with her. One is a bouncer and another is a play mat – both hand-me-downs from cousins. The bouncer has hanging props that she can hit when she is ‘boxing’ with her hands. Sometimes we also jingle these to catch her attention and help her move her eyes to see if she can focus. These props are right now at just about the right focus point of her eyesight. We use the bouncer a lot since she can play in it and we can use it to gently bounce her to sleep. We use the playmat for shorter periods during the day. The playmat has a lot more hanging toys which we rattle and shake to play with the baby. It can also play lights and sounds but I think the lights don’t attract her yet – perhaps because they are a bit out of her focus. I sit down with the playmat and rattle each hanging toy in a circular fashion continuously so she is entertained. We’ve also tried to play with her using soft toys but she doesn’t seem to fancy those – perhaps at a later stage. Sometimes I also carry her – holding her such that she is looking just over my shoulders – and walk about the house. This position is particularly useful when we have to calm her and burp her. If it is light out, we show her outside the window and talk to her about whats going on outside. Her final play time is just before going to bed. She is a late sleeper usually sleeping past midnight. However, at this time, we don’t actively engage with her to play. We try to rock her to sleep but usually end up carrying her in our arms and pacing the house. We generally sing lullabies to her while pacing back and forth. I also talk to her in hushed tones that she will be sleeping soon and gently swing her in my arms. Usually talking and singing to her and gently swinging her in a figure-of-eight motion does the trick and puts her to sleep. Some of the songs we sing are Lakdi ki Kaathi, Nani Teri Morni, and one more homemade Kutchi song about going places. Ananya also likes it when my wife makes faces and talks expressively, which holds her attention for short spans of time. AskAmma thanks Aashish for sharing this note, part of a series on Play. Gentle Reader, how do you play? AskAmma will feature selected stories periodically.